November 14, 2009 – The 2009 golf tournament featured 58 golfers competing for awards, trips, prizes, and auction items, the best weather imaginable, and was even more successful that the inaugural event in 2008. 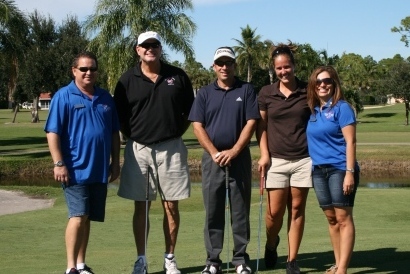 Briana Marie Cox Foundation Golf Tournament a Huge Success!! Palm Beach National Golf and Country Club in Lake Worth. After warming up on the driving range and practice greens, 58 golfers took to the course in a fleet of golf carts for a shotgun start. After the rounds were complete everyone settled in to the country club dining area for a fantastic buffet dinner, awards ceremony, prize drawings, and silent and live auctions. Thanks to the generous support of our sponsors below, raffle participants, and auction bidders, the Foundation raised more than $10,000 to help those in need. The Foundation is grateful to Palm Beach National, our tournament chairperson Mr. Danny Boivin, and our cast of volunteers for putting on such a great event.